Wi-Fi is something quite common in the world of networking. I don’t need explanation, why! But Ethernet ports are still used. Why Ethernet! Wi-Fi is easier and is accessible on almost all kinds of devices. There isn’t any doubt Wi-Fi is the talk of the town. But it has its own limitations. Security, Wi-Fi range is always questionable. But there isn’t such case with Ethernet networks. You might have a Wi-Fi in your house. But there are corners, where your Wi-Fi can’t reach properly. Herein lies the importance of Ethernet ports. Though Wi-Fi repeaters are available but buying Ethernet ports are economical. Let’s find some advantages of Ethernet over Wi-Fi. The range of Wi-Fi networks degrades with distance from the router. But Ethernet cables can run for long distances. There will hardly be any losses. Repeaters though are required. But only for long distances. Multiple Wi-Fi networks in the same area can lead to interference. But interference of that level is not observed in Ethernet networks. It is easy to eavesdrop packets from a Wi-Fi network. But Ethernet offers better security. Though security is improving day by day with Wi-Fi networks. But Ethernet already provides better security. At least against eavesdropping. There are numerous other advantages of Ethernet over Wi-Fi. It is for that reason, Ethernet is widely accepted even today. Ethernet networks are still popular nowadays even in offices. 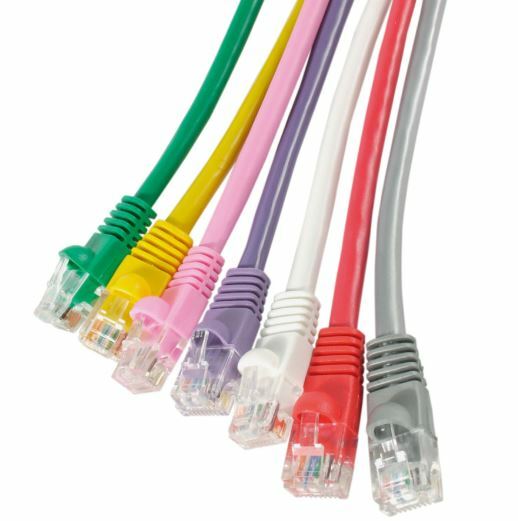 Ethernet cables are available in multiple varieties. The newer ones are better than the old ones. The new cables offer better reliability, protection from electrical interference, and longer signal transmission without losses. Cat 3 cables are not used any longer nowadays. They are kind of obsolete. The same goes for Cat 5 cables, as well. Still, it is worth knowing about them. Cat 3 or Category 3 cables are the oldest. They are not shielded and support 10 Mbps speed for 100 meters. The maximum bandwidth for the operation of Cat 3 cables is 16 MHz. Cat 5 cables are also quite obsolete nowadays. Cat 5 is also not shielded. Though it offers better speed at 100 meters. It can support 10 to 100 Mbps speed at 100 MHz. Cat 5e is used nowadays. Cat 5e does not have a lot of difference from Cat 5 cables. ‘E’ refers to Enhanced, and they are manufactured with better quality test standards. Due to better testing standards, there is better protection against cross-talk. Though unshielded, Cat 5e cables support a speed to 1 Gbps under 100 MHz. The production cost of Cat 5e cables is quite less. Thus it offers better value for money. It is the reason behind the popularity. Cat 6 cables are quite new. They are available with or without shielding. Cat 6 cables can support theoretically higher transfer speeds. It is up to 10 Gbps but limited to 55 meters. Cat 6 cables also support frequency up to 250 MHz. But there is a big difference between Cat 6 cables and its predecessors. Cat 6 cables are tightly wound. It thus eventually offer better speeds and protection against cross-talks. Cat 6a refers to Cat 6 Augmented. They are better than normal Cat 6 cables. Cat 6a cables support up to 10 Gbps under 500 MHz. Cat 6a cables being always shielded, they offer great speeds for long distances. Cat 6a cables are quite expensive and thus the setup costs are high. Cat 7 cables are always shielded and can support up to 10 Gbps under 600 MHz. Cat 7 cables are expensive. Yes, they are. But they offer higher speeds compared to that of the predecessors. Cat 7 cables are shielded and support the speed of 10 Gbps even for 15 meters. Thus the cables work great with most networks, where the terminals are located distant apart. Cat 7 cables thus are premium. Cat 7 cables are built with the latest Ethernet technology. It also comes with GigaGate 45 connector. Don’t worry if you are using an older device. It is backward compatible. RJ45 is the widely used connector and standard for hard-wired networks. They are used for data transmission. RJ refer to ‘Registered Jack’. RJ45 is widely accepted, and there are hardly any chances, they will be obsolete in the coming years. RJ11 connectors, on the other hand, are used in telephone lines. Gigabit Ethernet and Fast Ethernet. You must have come across the term while shopping motherboards and routers. They are nothing but two different standards offering different speeds. Gigabit Ethernet, as the name suggests, can offer up to 1 Gbps speed. They are widely used nowadays. Gigabit Ethernet ports provide faster internet than your Internet speed. Yes, generally speaking. 1 Gbps speed is really high and most ISPs do not provide such speeds as of now. On the other hand, Fast Ethernet can offer you speed up to 100 Mbps. Yes, even it offers more speeds than most ISPs offer nowadays. But it has its own limitations. It is better to go for Gigabit Ethernet! Even though your ISP provided network speed is a bottleneck. If you transfer files between your multiple computers, Gigabit Ethernet will serve better for you. In such cases, Fast Ethernet might saturate the bandwidth while using the internet and local file transfer at the same time. Thus, if you are tech savvy, and have options to choose from! Go for Gigabit Ethernet. As far as the Ethernet cable is concerned, go for the best. Cat 3 and Cat 5 are obsolete nowadays. Thus, I am keeping them away from this picture. Cat 5e cables are the minimum you should go for. It will serve most of your purposes. At least if you’re a home user. But if you stream a lot of media content, or transfer files over the local network, Cat 5e cables will be a bottleneck. But if you use internet on a single computer and your ISP doesn’t offer very high speed, better go for Cat 5e cables. It will surely fit your requirements. Cat 6 and Cat 6a cables is a better option nowadays. Due to the speed and reliability, it is most suitable for homes and offices. The speed also easily make it easily support media streaming and internet surfing, without causing bandwidth saturation. The Cat 6 and Cat 6e cables are great but the routers are the bottlenecks. Most mid-range support speeds up to 100 Mbps 1 Gbps. But Cat 6 and 6a support better speeds. Hence the routers become the culprits. But if you need even better speeds, go for Cat 7 cables. Cat 7 cables are worth going for if you have special requirements. Most devices nowadays come with Gigabit Ethernet ports. So you need not worry about it. But if you are using a very old device, you can go for a router with Fast Ethernet ports. But make sure your internet connection is not that fast, and you do not do a lot of media streaming. Going for Fast Ethernet is not recommended unless you get a great deal. It is always a good idea to be future ready and go for Gigabit Ethernet ports.